Update 1: the following 3 sections added: 1). How to use and enable Galaxy S5 Selective Focus? 2). How to change focus for photos taken with Galaxy S5 Selective Focus? and 3). Why did I fail to use Galaxy S5 selective focus successfully? What is Galaxy S5 Selective Focus? Galaxy S5 Selective Focus allows you to focus on what’s important by blurring the background and accentuating the main subject in defined detail. Essentially, Galaxy S5 selective focus lets you choose to focus on the foreground, background, or focus evenly across the image. That’s it. And it is pretty cool. For example, check the photo below. In the past, you have to rely on DSLR cameras or photoshop to get the similar photo. With selective focus, Galaxy S5 can easy take such pictures. Once the photo is taken with Galaxy S5 selective focus, it is saved in your Galaxy S5 and you can view it as normal photos. But you can do more with photos taken using selective focus: you can change the focus as you want in the gallery and save it as a new photo. In other words, Galaxy S5 selective focus allows you to change your mind by changing the focus on the original photo. You have 3 options for the focus: near focus, far focus, and pan focus as showing below. Please note, you can only change focus in Galaxy S5. If you transfer the photo to other devices, it is a normal photo with the focus you last selected. There is no option to change focus. Does Galaxy S5 Selective Focus work with video? The selective focus in Galaxy S5 is really interesting and useful. You may wonder whether this feature works for video. For example, you want the focus always to be on a person or an object. Unfortunately, Galaxy S5 selective focus works with photos only. You cannot use this feature for taking videos. The main reason is selective focus does not track the motion of the object. Also, the additional processing efforts needed make it impractical to use this feature for videos. What are the side effects of Galaxy S5 selective focus? The price you have to pay for Galaxy S5 selective focus is the additional processing time. In other words, after taking the photo, it will take considerable time to process the photo (so that later you can change focus). When taking a selective focus photo, you need hold S5 still for noticeably longer time than that for normal photos. It is even not as fast as HDR in Galaxy S5. But it should be close or slightly faster than taking HDR photo with other smartphones (e.g., Galaxy Note 3). How to use and enable Galaxy S5 Selective Focus? 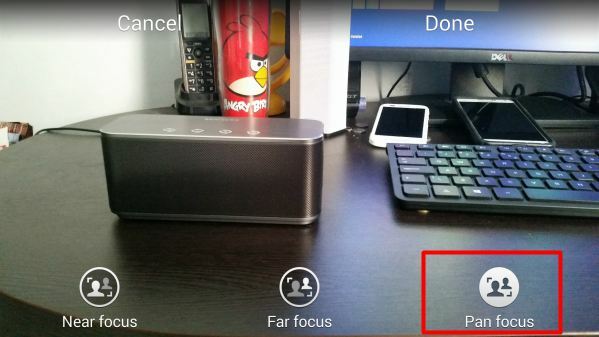 By default, Galaxy S5 Camera app has two shortcuts added in the left side. The first one is selective focus. The other one is HDR. 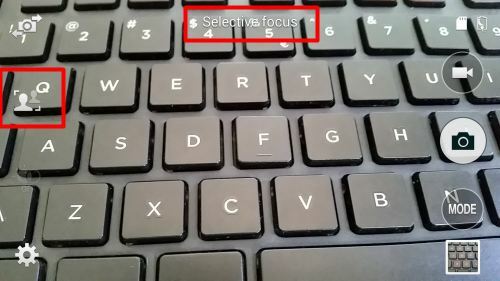 You can tap the shortcut to enable Galaxy S5 selective focus immediately. The selective focus mode will be indicated on the display as shown below. Because HDR (rich tone) does not work with selective focus, HDR icon will be grayed out once Galaxy S5 selective focus mode is enabled. If, for any reason, the shortcuts in your camera app are not the default two. You can manually add selective focus to the shortcut. This means you can also add any shortcuts to replace selective focus if you are not happy with selective focus. In the camera app, tap setting icon (the gear button). Then in the settings window, you can tap and hold any items, then drag it to the shortcut location. This will essentially add a shortcut for this item. How to change focus for photos taken with Galaxy S5 Selective Focus? Once a photo is taken successfully with Galaxy S5 selective focus, you can change the focus when editing it in Gallery app. The edit icon for such photos are slightly different from other photos as shown below. 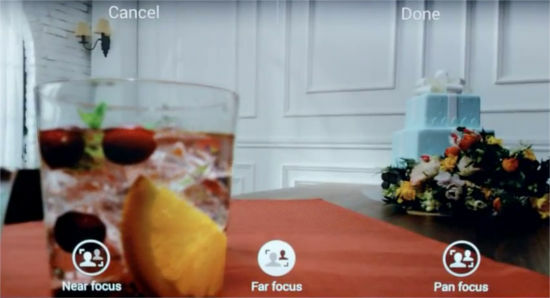 You may find the differences of these 3 focus modes easily as shown below. Why did I fail to use Galaxy S5 selective focus successfully? It is not so easy to make Galaxy S5 selective focus work as expected. A lot of Galaxy S5 owners often get the message of selective focus not applied. This means you will only get the normal picture. your luck (sometimes, it simply refuses to work). Do you have any questions on using Galaxy S5 Selective Focus? Please let us know them in the comment box below. why i don’t see selective focus tool? 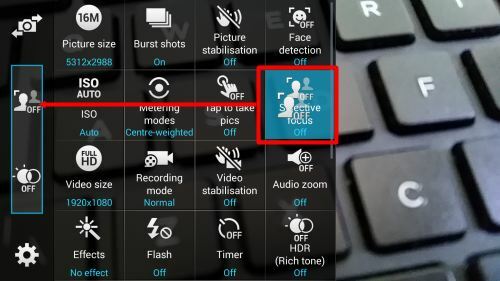 In camera interface, the second in the left (in landscape position) is for you to activate or deactivate the selective focus mode. Only photos that are taken with activated selected focus mode can change focus in the future. You need make sure the selective focus is successfully applied when taking the photo. Open your Gallery, find the photo, tap edit button, and then you can change focus. i cant find the focus i seled auto focus and go to gallery and the icon of selectiv focus its dont there i dont know why do i need to change something ? After taking picture with selective focus, it always(almost) “subject not detected”. Why? Selective focus works best with distinct objects in foreground and background. Did you try it with simple scene? The front object should be about 5 feet or closer. Yes, the rate of success is not so high. Sometimes, the newly-released Google camera can do a better job on this. My selective focus is not working. It just says something about contrast . Did you try it with normal lighting conditions with an object in foreground and objects in background ? I can’t activate the selective focus on my S5 can you tell me how I can activate it? 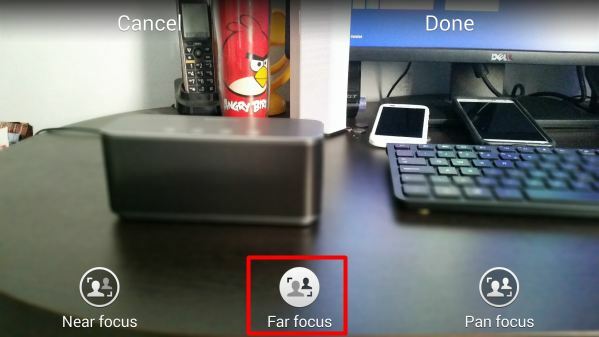 After starting the camera app, in the left side (in landscape position), the second button is (next to front /rear camera switch button) for you to activate selective focus. If you scroll down, you can find more settings. The last one should be Reset settings. Try it. By default, the shortcut was placed between the front /rear switch and hdr. You can always go to the camera settings to change the mode to selective focus. I had the same problem of the selective focus and settings icon not appearing on the screen. If you go to settings \ personalisation \ easy mode and then change it to standard mode, the selective focus should now appear on your camera. There are no words showing up on the screen giving options as I’ve seen in several videos. The options let you choose fore or aft ground to be unfocused and other things. Where is this feature? If the photo was taken in selective focus mode AND s5 didn’t complain anything, you will have the option for the photo in the gallery after you tap the edit button. Do you mean taking photo with selective focus or changing focus for the photo? To take photos in selective focus mode, you need tap the second button on the left. If it is unsuccessful, a message will show on the screen and the photo will be saved as normal photo. You can later change focus for photos taken successfully with selective focus on the gallery when you with the photo. I’m having trouble with changing the Selective focus after I have taken the image. I got the phone so I was trying the new camera features. I was taking a picture of a doll with Selective focus. I selected the doll to focus on, after that the doll was clearly visible and the background was blurred as it should be. Then I toke the picture with the doll still focused but the Processing dialog sometimes appear and sometimes it doesn’t. 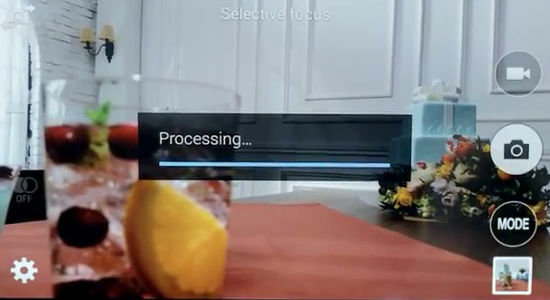 In both cases a dialog appear after the picture is taken saying: “Picture saved, but unable to apply Focus contrast effect. Select area to focus on and try again.” And when I open the picture in the gallery, the Selective focus do not appear. And also the green circle that appear when I tap to select the focus, sometimes appear red. What is the problem ? If you get that message, it means the photo can only be saved as normal photo. So when you edit them in gallery, there are no selective focus related tools. If selective focus is successful, later you can change focus on gallery. Selective focus works best with an object close to the camera, and other objects far from camera. We will add some detailed guides on using selective focus on s5 based on our tests. You can only change focus for photos taken successfully with selective focus. If the icon doesn’t show up when editing photos in gallery, it means the photo was not taken with selective focus. By default, the selective focus button is the second in the left in your camera app. If you cannot see if, you may check whether you are in easy mode. For me, it sometimes does not work either. But I found that the selective focus works best when: 1). foreground object is not far from your camera (the guide says around 0.5m). and 2). there is a clear background object, or pure landscape, and 3). the distance between the background object and foreground object is not too large or too small. In gallery app, open the photo, tap edit. If the photo was taken successfully with selective focus, you should see the option. Selective focus never finds the object. Hasnt in weeks at least since the update. When i first got the phone I could use on pretty much anything near or far. Now it wont focus on something 10 inches to three feet away. I know it is not your job but obviously you are someone to samsung. This thing needs an update asap. Also, sometimes selective focus isnt even an option. I had to reset the camera settings AND close the app just to get it to become an option again. A lot of s5 owners reported some issues on selective focus and camera app. Maybe, you have you wait for the update. my S5 selective focus is not working. what we have to do?? You need enable the selective focus first. The foreground and background objects must be easily identified. in my S5 camera don’t have settings option and selective focus option. pls give replay as soon as possible. You are very likely in easy mode. Switch to standard mode. In your phone settings, under easy mode, you can select standard to normal mode and you will get all functions. You are very likely in easy mode. Go to settings – easy mode, change it to standard. When I take a picture it automatically goes to view that picture. I would like to take picture after picture without having to go back to take another picture. in your camera app, tap the settings button (gear). By default, it shows 16 settings. You can flick up to scroll down. 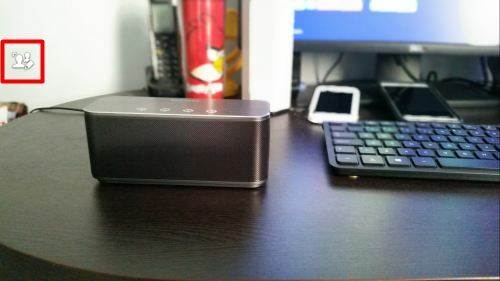 You can then find Review Pic/videos. Tap it to toggle it on on and off. Why does selective focus keep greying out and making it unable to use? It was greyed out, then I resented my camera settings and closed the app and it came back. But I just went to take another picture about 30 minutes later and it’s greyed out again. Anyone know why? It may be caused by other setting, e.g., if you use front camera, it will be grayed out. The front object should be around 50cm away from your s5. There must be a background object that is at least a few meters away from the camera. You need a foreground object and background objects. One you get one, you will understand the requirements. I will try to update this page with more details this week. Did you get any error messages? Are you sure they can receive text messages? my S5 internet browser was not working… when i connect to http://www.google.com also its showing cant connect to the server, at the same time i can acces the google with chrome browser, what is this?? Not sure. Both the internet app (stock browser) and chrome should use the same connection. This is probably due to poor Internet connection to Google play store server in your region. You have to try it later. If you at using mobile data, you may try WiFi. Guys I can’t find the setting to change the camera modes! The cam doesn’t have the round setting wheel? You are probably in easy mode. Settings after available in standard mode. Check your settings – easy mode. So I need to know how to detect the subject exactly? And what is the difference between the red circle and the green circle that appear when I am taking photos? Red circle usually means the low-light. Green means the camera finds the object (but this does not mean selective focus will work eventually). Yes, it is not easy to use Galaxy S5 selective focus. So some basic requirements: 1). the front object should be about 10-60 cms away from the camera; the background object should be at least twice of the distance mentioned in 1); and 3)the background should be some objects, NOT plain walls; 4). the objects are not moving; and 5).your luck (sometimes, it simply refuses to work. Problem with my pictures for my Samsung Galaxy S5 Camera, when I took the picture, the picture looks great very clear with all the sharpness and everything, it looks great as same as it shown on the camera phone. However, when I closed out the camera and then go right back and look at the picture which I just took, and it was not look the same. No sharpness. Not clear at all. Please advise as how to correct it. Because, when I first bought the phone the picture looks great. Appreciated for your assistance. After you taking the photo, the photo should not change. Are you comparing what you “see” on the screen before taking the photo and what you get. Very likely, there are some changes in your camera setting. In camera app, tap the setting (gear) button, scroll all the way down, and reset your camera to default. I could not find the Camera App anywhere? Would you please listed step-by-step how to get there. Appreciated for your assistance! I did it a couple times but still doesn’t restored to the origin like when I first bought the phone. The reason I know the picture looks different is because I still had the the very first picture I took in comparing with the current picture. No sharpness. Not clear at all. Please advise what is the next step in which I should do. Thank you! If none of them works, backup your data and perform a factory data reset. Just the Camara in your s5. My music player was not auto updating, when i download or added some songs, then i have to restart the device, then only those tracks will add to my player? If you add the music from pc (through an USB cable), or download using Internet app (not other browsers), the music files should be updated instantly. However, if you get the music through other apps, they will not show up until next file scan (usually during reboot). Inside your camera app, tap the settings button (the gear icon), scroll down to next page, then off review pics/videos. Are you in easy mode? Settings–Easy mode. Change to standard mode to access all options. Is there any software that I can open these pictures on PC?, and still able to choose near, far, or pan focus. Not yet. Currently, you can change focus only in s5. On pc or other systems, it’s a normal photo. I can get selective focus to work but then can only choose near or far focus..pan focus is always greyed out ?? does it happen to all of the photos (with selective focus) or just a few? If it happens to all, you may reboot the phone. You may also try to clear cache and clear data for camera app. Download booster is only triggered for downloading files that are larger than 30mb. The speedup depends on the speed difference between your 4g connection and wifi connection. The smaller, the better. If you are out of 4g coveted area, download booster will not be triggered at all. In other words, if only works with 4g,not 3g. It was an option in the setting , that: Developments,and i have activated,and then sometimes the phone freezes and stutters why?,and when i restart the phone and I disabled this option it worked…why?? I am not sure which settings you are referring to. You may give details and the access path to that setting. actually before marshmallow update .. selective focused working superbly. .. after marshmallow update the picture .. wa’s not clear and it’s and not exactly view .. and some shaded colours are appire. .before capture photo it view ok … but takein photo .. very bad to view .. ifor you give .. your email I’d I will send the before after photo’s .. after that you will identify exact problem of this..
You can try to reset camera settings. Then try again. You can post any photos in our Facebook page. For selective focus photos, you need save them with different focus (as different files)n when sharing to Facebook or other non-Samsung phones. Does it happen to all photos taken with selective focus or only some? You can try to reboot the phone to see whether it helps. I am embarrassed to say so, but it actually solved it. Now is working as supposed.